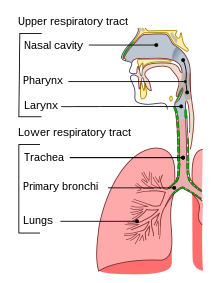 Trachea sive trachia sive aspera arteria (Graece τραχεῖα (ἀρτηρία)) est in homine et aliis vertebratis ductus inter superiora membra respirationis (nasum, os et laryngem) et bronchos pulmonum situs, in qua regione trachea bifurca in duo magnos bronchos abit, qui deinde in multos parvos bronchos in modum arboris dividuntur. Trachea hominis circiter 10–12 cm in longitudinem patet. ↑ 1.0 1.1 Triepel, H. (1927). Die anatomischen Namen. Ihre Ableitung und Aussprache. Anhang: Biographische Notizen. (Elfte Auflage). München: Verlag von J.F. Bergmann. Novissima mutatio die 13 Augusti 2017 hora 13:25 facta.